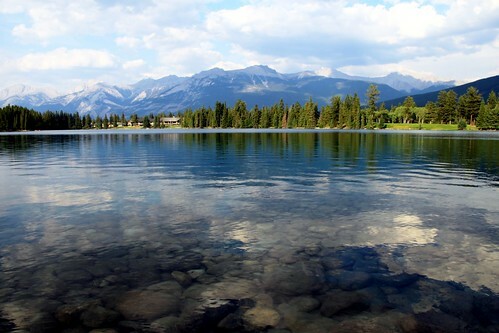 Lac Beauvert is the lake bordering the Fairmont Jasper Park Lodge – the legendary and classic hotel in Jasper National Park. While the Jasper Park Lodge gets props for being around since the early 1900s, the lodge benefits from the beauty of Lac Beauvert and the surrounding Canadian Rockies. Lac Beauvert is a small lake at only 0.4km2. Even for Jasper visitors not staying at Jasper Park Lodge, a trip to the lodge for the scenery is worth it. The lodge also has several dining options and the lake has a nice path along its edge. So, a dinner and a walk could make for a relaxing way to spend on evening after a day of Jasper National Park activities. Lac Beauvert and the Fairmont Jasper Park Lodge are a short drive from Jasper townsite and it shouldn’t take longer than 15 minutes from the townsite to the lodge’s parking lot. Then the beauty of the lake awaits.